Description: Ice Princess loves changes so she decided to get a new haircut for the Ice Queen's coronation. It's a really big event so you must use your hairstyling skills to make her look amazing. 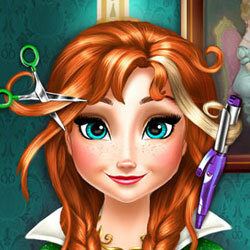 Trim, cut or curl her hair using professional tools and figure out what kind of hairdo fits better for this adventurous princess. There are over 20 colors you can use to make her hair stand out, then you can add a bit of glitter or some hairpins, accessories can make a big difference. Choose a princess dress from her wardrobe and she is now ready to spend a fun night in the castle meeting new people.